After a particularly long & hot day at my far away job, hubby was chatting with me in the car as we headed home. I was hangry, and looking back, just ready to blow. Hubby shared about an email he got from a friend who is all riled up in his disappointment over the stand a public figure has made about what the church should do about a hot topic. And i lost it, as i got revelation at the same time. We get all caught up in what he says or what she thinks, when we should be more focused on what He says, and seeking Him when things aren’t as clear. 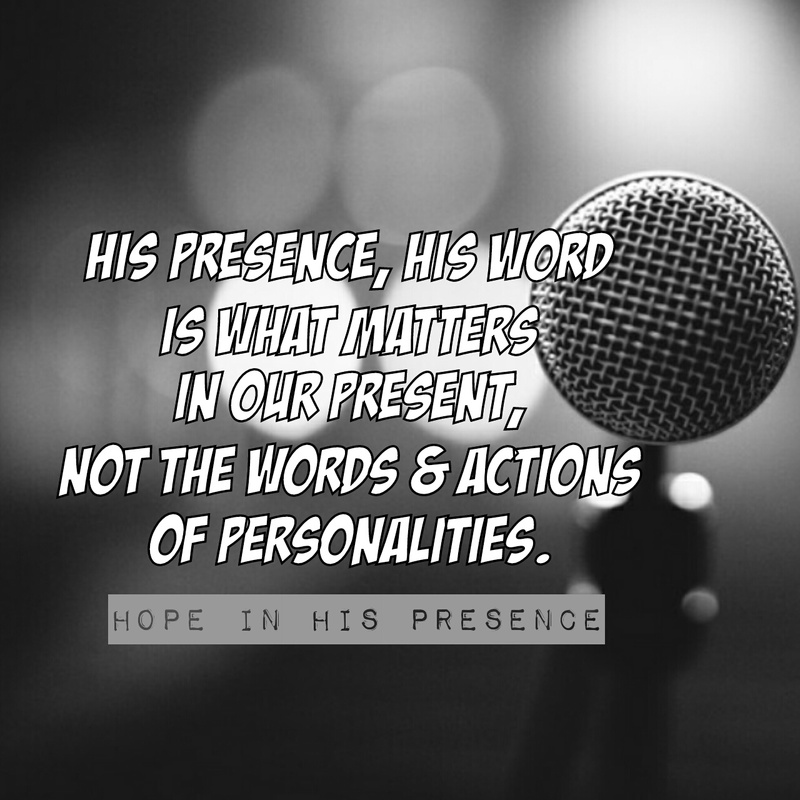 His Presence, His Word is what matters in our present, not the words & actions of personalities. I immediately apologized to my hubby for my yelling my comment at him, but we both agreed it was a true statement, despite the delivery method. When did we accept what humanity has to say about the church is more important than its Head’s instructions? When we judge, bicker, backstab & gossip about where we stand on church issues, we fail to see where Jesus took His stand. He died so we could find Him wherever we were, no matter what we have done. He died to welcome us into His family. He died so we could fully live, as He intended. He died for us to be free from the world’s mindset & treadmill. He died for us, so we could follow Him, where He leads. Its time to stand on His words, and stop fooling ourselves that people matter more than His standards. That’s what got us into the messes of our world’s history, and why He had to come rescue us. How does Jesus feel about His church? He doesn’t want us to settle for second rate or second best again. He wants us to seek His ways first, in everything now that we are His. Especially in regards to His bride. As part of His bride, I want to be the bride He wants me to be. As we seek His standards for the church He so loves, I pray we will press in to the Word, become more obedient to hearing His voice over all the distractions, and follow where He leads us.